We’ve all heard rumors about JPMorgan Chase coming out with its own version of a prepaid product. It’s finally been released and is available at every branch. As of today, consumers can now own what’s likely to be one of the best prepaid debit cards on the market. Keep reading as we explore what the banking giant is offering. Believe it or not, the fees are minimal. Seriously. There’s a monthly $4.95 fee and there’s a $2 fee for using any out of network ATMs. And that’s it. No lost card replacement fees, no fees for withdrawals and no fees just to speak to a live person. You can receive free account alerts, too. Simply by texting “bal” to 24273 will result in an immediate account balance texted back to your phone. Be sure to add your mobile phone number to your account, though. 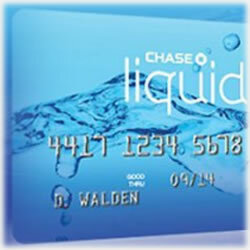 You’ll notice the massive bank is marketing the Liquid card as a checking account alternative and what’s really surprising is it’s actually cheaper than owning one of its bloated checking accounts. Let’s face it, JPMorgan Chase hasn’t made many friends recently. In fact, its controversial CEO Jamie Dimon is one of the most disliked bankers in the nation. He’s outspoken, brazen and often very wrong. While everyone is applauding the absence of so many fees, many are waiting for the other shoe to drop – and it very well could. The bank’s still looking for ways to make up lost revenue. Getting the card is easy. Simply stop into any Chase branch to open your Chase Liquid account. At that time, the branch will issue a temporary debit card you can begin using immediately. Your permanent card will arrive in the mail within about a week. Once you receive your permanent card, you’ll need to activate it and then destroy the temporary card as it will no longer be valid. Remember, there’s no charge to open the account, but it does require a minimum $25 initial deposit onto the card. From there, you don’t have to worry about maintaining a minimum or maximum balance. The only other requirements are that an applicant is at least eighteen and provides sufficient identification. Withdrawing cash is made easy. At more than 17,000 Chase ATMs, card holders can withdraw up to $500 a day. Plus, users can withdraw cash at any Chase branch, too – and it’s free! Of course, you can’t withdraw cash until you deposit cash – and this is easy too. You can sign up for direct deposit or make deposits at any Chase bank. You can even deposit checks or cash at any of the 10,000 -plus Chase DepositFriendly ATMs. As far as using it for purchases, card holders have a $3,000 a day maximum and it’s accepted anywhere Visa is accepted. It offers the same conveniences as every other traditional debit card. As we mentioned, speaking to a customer service rep is free and easy. Whether it’s by phone or if you walk into any Chase bank, you don’t have to worry about being charged for a few minutes of a banker’s time. It’s all complimentary. This is definitely one trend we hope other prepaid debit card programs begin to offer. Zero Liability Protection applies for any unauthorized card transactions when you notify Chase as soon as you notice the compromise. Users also enjoy Guaranteed Reimbursement for any unauthorized purchases and withdrawals and the best part is Chase will put it back into your account no later by close of business the following day. Of course, your funds are FDIC insured. The market for the Chase Liquid is low income consumers who are either unbanked or underbanked. Frankly, it’s refreshing that a bank issues a debit card that works to serve the user versus the issuing company and credit card networks. Someone is thinking of how to best serve those who don’t have access to traditional banking sources. We can only hope the priorities don’t shift as the Chase Liquid continues to gain in popularity. Because it’s in low income communities, this financial product can offset the controversial payday loans that seem to rein supreme in these communities. You won’t receive paper statements – but you will have access to your statements on the Chase website and you can also have them emailed to you each month. It’s a very eco-friendly avenue – and Chase is definitely stepping up to the plate. Finally, it’s important for consumers to keep in mind that this is a prepaid card. Unlike a secured credit card, you won’t have any reports made to any of the bureaus. While it’s ideal as a checking account alternative, it won’t affect your credit scores. This sounds like a prepaid credit card since it carries a zero liability and it’s accepted where visa is. This card will probably be very popular with parents since it will allow them to transfer funds easily to their underbanked children. It will also get our new consumers used to using cards vs cash, caus it’s cooler.